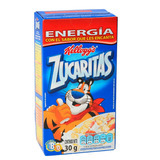 Cereal Kellogs Zucaritas 30 Grs. Cereal Nestle Trix 470 Grs. Cereal Quaker Avena Flakes 220 Grs. Cereal Nestlé Cookie Crisp 480 Grs. Cereal Nestlé Fitness Fruits 350 Grs. Avena Natural Quaker 1.19 Kgs. Avena Instantánea Quaker Manzana Canela 35 Grs. 25 Uni. All Bran Original Kellogg´s 465 Grs. Extra Arandanos Kellogg´s 420 Grs. All Bran Pasas Kellogg´s 285 Grs. Corn Pops De Kelloggs 210 Grs. Corn Flakes Kellogg´s 400 Grs. Cereal Kelloggs Corn Pops Ekonopack 100 Grs. Nature Valley Barras De Cereal 26 Piezas. Cereal Quaker Multi Bran Pasas 220 Grs. Corn Flakes Kellogg´s 150 Grs. Froot Loops Kellogg´s 90 Grs. Special K Kellogg´s 260 Grs. Special K Chocolate Kellogg´s 380 Grs. Cereal Extra Con Arandanos 310 Grs.